FAIRFIELD, CONN. – Monday evening May 15, forty-two Fairfield students competed for top honors at the annual town-wide Spelling Bee with Andrew Ung of Burr School outspelling all other opponents. Continuing a three-decade long tradition, the Junior Women’s Club of Fairfield once again hosted this inspiring event. Held at Roger Ludlowe Middle School, the event promised to keep audience members on the edge of their seats as the classroom winners from fifth grade classes in Fairfield’s public schools vied to outspell their opponents, and it did not disappoint. Classroom winners were challenged to spell words such as “momentum” and ”gaiety” throughout the rounds. 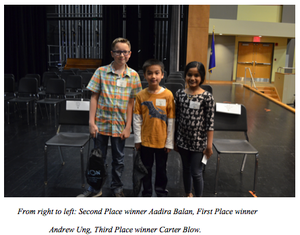 Andrew Ung emerged as the Winner of the Spelling Bee by spelling the word “concentric”. Other top finishers were Second Place winner Aadira Balan of North Stratfield School and Third Place winner Carter Blow of Jennings School. The top three winners received special prizes donated by the Fairfield JWC, Bankwell, People’s United Bank, The Kumon Math & Reading Center Downtown Fairfield and Saugatuck Sweets in Westport, CT. All Bee participants also received JWC award certificates and goody bags from Kumon. This year’s Spelling Bee judges included Helene Murtha, Head of Children’s services, Fairfield Public Library ; Lisa Thornell Student Engagement & Outreach Librarian DImenna-Nyselius Library Fairfield University and John Kovach, Editorial Director HAN Network, formally Hersam Acorn Newspapers.. In addition to the Spelling Bee, the JWC of Fairfield hosts a “Touch-a-Truck” event, which raises funds for scholarships for Fairfield high school women, and “A Visit to Santa’s House” in December, the proceeds of which benefit the club’s charitable partner. The club also hosts community service projects and social events throughout the year. To learn more about the club, visit www.jwcfairfield.com. The club can also be found on Facebook and Twitter (twitter.com/jwcoffairfield).